Earlier on last month, Honda reverted to price cuts to clear existing stocks of the 2010 Honda Jazz. 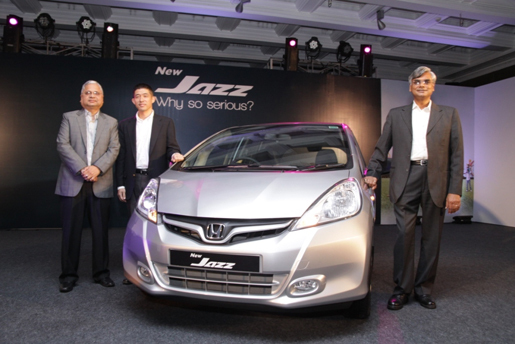 Well, today, Honda have finally brought in the 2011 version of the Honda Jazz to India. Honda have retained the 1.2 liter engine with 90 Bhp at the helm and its got more to do with some cosmetic changes as also the inclusion of some more features in this car. The best thing that Honda have done is to do away with the earlier ridiculous for a hatch price tag and have brought in a more realistic one. The 2011 Honda Jazz has got 3 variants in place and those are the Standard, Select and the X. The revised pricing starts from Rs 5.5 lakhs for the base Standard variant, Rs 5.75 lakhs for the mid of the line Select variant and Rs 6.06 lakhs for the top end X variant. All these prices are ex-show room, Delhi. All the variants would have EBD, twin airbags and also ABS as standard. The mid Select variant gets alloy wheels while the top end X version gets a set of sporty ones. Space wise, the Jazz is still the best in its class with a somewhat sedan rivaling 336 liters of boot space. The “Magic Seats” also have been retained. In its class now, the Honda Jazz has gone from being one of the highly priced hatches to one of the best value for money proposition things. Minor cosmetic changes is what would set the 2010 and 2011 models apart. How the face-lifted as also now more “correctly” priced Jazz fares in the market, only time would tell. Honda were tight lipped about the prospect of introducing a diesel power plant in their lineup for the Indian market. Super excited, just took a test drive and have already defered my decision of graduating to a SEDAN level, why graduate when you have a super luxory hatch back giving equal or in some cases more features than a sedan. I have made up my mind to book the JAXX X variant this Dussera. Only worry is there is a long que and will have to wait for 4 months, before I get my hands on this beauty.